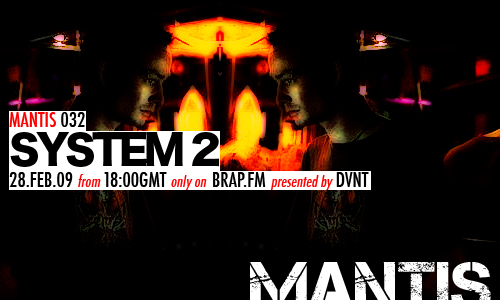 Mantis Radio hosts a session from System 2 – the DJ alias of Charlie McConville and a production collaboration project with James Field. System 2 is the DJ alias of Charlie McConville and a production collaboration project with James Field. Their sound fuses elements of breaks, electro and tech funk. This Mantis Radio mix showcases the System 2 DJ sound incorporating a range of influences from deeper 4/4 styles to electro influenced house to techy breaks. The mix includes tracks from the 1st System 2 digital EP which is due for release in March on R3tox Digital Recordings. The System 2 sound can currently be heard at the Quandry nights in Windsor and the Delirious parties at the White House in Clapham as well as various warehouse raves around East London.